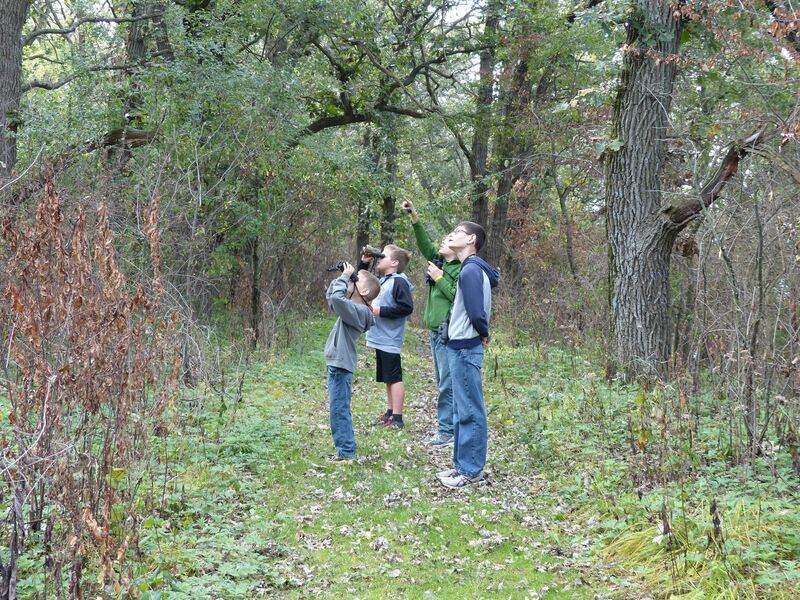 Young birders, parents, and grandparents enjoyed a fun morning full of birds at Terry Trueblood Recreation Area in Iowa City on October 15! You can view photos from the trip here and a species list here. Many thanks to Board Member Fawn Bowden for leading the trip and for the photos! Fifteen young birders, parents, grandparents, and volunteers landed at Palo Alto County Conservation Board’s Lost Island Lake Nature Center in the heart of the Iowa Prairie Pothole Region for a morning exploring the many wetlands and prairies of this area. Although a bit breezy, it was a pleasant morning to be outdoors. We started at Lost Island Lake, viewing the many Franklin’s Gulls that had yet to depart their overnight roost on the lake for a day of feeding and flying. Among the hundreds of Franklin’s Gulls was a single female Ruddy Duck, one of the smallest ducks we see in Iowa. Despite having a variety of prairie and wetland birds as targets for the trip, we couldn’t ignore the allure of the woods in the heart of fall migration! We hiked a short loop through Lost Island Lake Park and enjoyed several exciting birds including two Yellow-bellied Sapsuckers as well as a small flock of migratory songbirds that included a Tennessee Warbler, Blackburnian Warbler, and Red-eyed Vireo. Near the end of our hike through the woods, we received word of a Sanderling at the nearby beach. We quickly loaded the vehicles and headed there. We searched tirelessly for the small shorebird and were finally able to locate it just before giving up our effort! All participants quickly located the juvenile bird as it walked towards us. The bird continued to walk towards us until it was nearly three feet in front of us! Not only was this a life bird for most, but it was also the closest anyone in the group has ever been to this species! Also present along the beach was a Spotted Sandpiper, and the “icing on the cake” was a flyover Peregrine Falcon. After the beach, we loaded the vehicles once more en route to a wetland area just north of the lake. As we arrived, we immediately spotted a cryptic Wilson’s Snipe among the cattails. We quickly assembled the spotting scopes for closer inspection by all. A Common Yellowthroat and Marsh Wren were voicing their presence as we viewed numerous Killdeer and a couple Pectoral Sandpipers in the drying area of the wetland. We then focused our efforts to some more secretive birds, Sora and Virginia Rails. Volunteer leader Lee Schoenewe had the right tools to entice these birds into view, an mP3 player and speaker to play their calls. It wasn’t long before both species were calling in response, and with some patience all were able to see both species as they darted among the cattails. A great end to an exciting morning! On August 26, 2017, 15 young birders, parents, grandparents, and volunteers were welcomed with a pleasant late summer morning at Swan Lake State Park near Carroll. Carroll County Conservation Naturalist Matt Wetrich, our guide and local expert, welcomed us to the park and provided quick tips on using binoculars and bird guides. We had an exciting morning planned with several different stops within the park, and we anxiously started off. Our first stop involved a search for woodpeckers and various songbirds in an open forest area near the campground. We quickly heard Blue Jays, an Eastern Wood-Pewee, and White-breasted Nuthatch. We headed down to a fishing pier on the lake, and once there were greeted with a flock of Purple Martins. After receiving fleeting looks of a Red-headed Woodpecker, we were finally able to get great looks at one perched on dead limb low in a nearby tree. We also flushed a Common Nighthawk from the tree, a very exciting experience! A bit further down the trail, an Eastern Wood-Pewee and Eastern Kingbird were perched in the open allowing us to carefully study these two closely-related species. This was a great stop! After a quick stop near the lake to view a Baltimore Oriole nest, we headed up to the Bald Eagle display and nearby trail. At this stop, Matt shared with us the story of the two resident eagles at Swan Lake State Park. Both eagles were injured and are now permanently housed at the park for educational purposes. We took this opportunity to learn a bit about bird conservation and about the important parts of responsible decisions, knowledge and caring. Afterwards, we headed down the trail to a large brush pile. Although quiet initially, the brush pile produced many good birds including Indigo Buntings, a House Wren, a Wilson’s Warbler, and both Blue and Rose-breasted Grosbeaks. A Cooper’s Hawk and several Turkey Vultures were soaring overhead as we searched the brush for more birds. We finished the morning visiting the swan pond, home of a captive pair of Trumpeter Swans, and then the new Thelen Bird Sanctuary and bird blind. A Hairy Woodpecker visited the feeders while in the blind, and a Belted Kingfisher flew low over the lake as we compiled our morning list. Both were great birds to finish a fun morning! We are very appreciative of Matt’s leadership and expertise on the trip. You can view photos from our trip here and our species list here. Many thanks to all those who attended! On July 8, 2017, sixteen young birders, parents, and grandparents gathered at Seed Savers Exchange near Decorah for a gorgeous morning of birding. Barn Swallows and a singing male House Wren greeted us as we started up the Oak Woods Trail. Before the trail head, we stopped near the barn to listen to a signing Chipping Sparrow and American Robin, two common Iowa birds but always fun to hear! As we headed up the trail, we stopped at a clearing near the top to listen to and view a Mourning Dove in the distance. We also heard a singing Indigo Bunting at this location, who graced us with his melodious song but did not let us see him. A bird that did welcome us, however, was a stunning male American Goldfinch who landed approximately 10 feet from us in the opening for fantastic views. We continued along the trail to the overlook where we spent nearly 20 minutes viewing several exciting birds. From this location, we saw a small flock of Cedar Waxwings, a Brown Thrasher, a cooperative Eastern Wood-Pewee, and a Ruby-throated Hummingbird among others. Singing high in the treetops was a Blue-Gray Gnatcatcher. We headed back down the trail to the main yard, stopping briefly in the gardens for a brief lesson about the importance of plants to birds. We discussed how birds use plants for food, shelter, and nesting, and about how different birds use different plants. We enjoyed the many colorful blooming plants while taking a water and snack break, then continued to the Orchard Trail for another hike. After a short distance along the Orchard Trail, we heard an Eastern Towhee in the distance. It wasn’t long before we located the bird in the understory. Not too long after, we located a male Rose-breasted Grosbeak feeding a young bird on the forest floor. We also heard a Wood Thrush singing in the distance. We finished our hike along the creek where we saw and heard Song Sparrows, a Common Yellowthroat, and Downy Woodpecker. As we hiked through the parking lot back to our vehicles, the last bird of the day was a singing male Northern Cardinal. We finished the day with 35 species, including many other highlights not listed above. You can view our trip list here as well as photos from our morning here. Many thanks to all those who attended and to Seed Savers Exchange for hosting us! 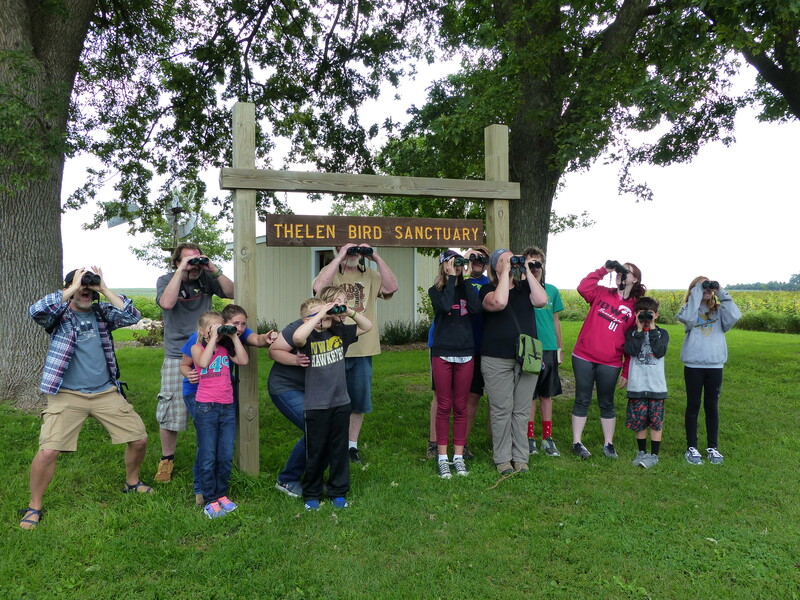 On a warm and breezy summer morning, seven young birders and parents joined us on a morning exploration of Chichaqua Bottoms Greenbelt, a prime birding location near Des Moines. Our target birds were the Prothonotary Warbler and Green Heron, both bottomland forest specialists and frequent residents of Chichaqua Bottoms. Excited to see both birds, we set off. However, before looking for birds we took the unique opportunity to observe a female Painted Turtle actively laying eggs in an excavated nest not far from the water. Later in the morning after she was finished and heading back to the water, Executive Director Tyler Harms captured the turtle and quickly showed young birders the beautiful markings (which give the Painted Turtle its name) on the underside of the turtle’s shell before safely placing her back on her journey to the water. Next, we walked along the campground towards the Jack Pine Trail looking and listening for birds. American Redstarts, Eastern Phoebes, and Eastern Wood-Pewees graced us with their songs and Red-headed Woodpeckers flew overhead. High in one of the trees, a parent found a Cedar Waxwing nest and we all watched as both parents brought material back to the nest. An exciting sight for all of us! Our hunt for Prothonotary Warblers and Green Herons continued along the Jack Pine Trail. Although we did not see any of our target birds along the trail, we did hear several House Wrens and our only Great Crested Flycatcher for the morning, had great looks at a stunning male Indigo Bunting, and saw and heard several Gray Catbirds. We headed back to the trailhead and stopped for a quick snack and water break. Not long into our break, one of our parents spotted a Prothonotary Warbler across the water from where we were sitting. Soon, the bird flew into plain view and everyone watched the bright yellow beauty for several minutes before it flew out of sight. Finally, we could check off one of our target species! We wrapped up the morning tallying our species, and some ventured out on canoes to search for our second target species, the elusive Green Heron. We saw not one Green Heron, but at least four Green Herons at different areas! We grateful to Shelly and James with Polk County Conservation for allowing us to use their canoes. And thanks to the young birders and parents for joining us! You can view photos from our trip here and our species checklist here. We had a great time learning about Barn Owls and building Barn Owl boxes as part of the Lucas County Birding Festival on May 6, 2017. We are grateful for assistance from volunteers Adam Janke, Coady Lundy, Jacob Newton, and Dave Offenburger. We also thank Helga Offenburger for preparing the Barn Owl nest box kits, Beth Brown for sharing her knowledge of owls with us, and Nick Piekema with Iowa State University Research and Demonstration Farms for hosting us. You can see photos from our fun event here! In this issue of "A Prairie Girl's Notebook", Iowa Young Birders member Coralee Bodeker shares the magnificence and importance of trees, even after they have fallen. Another great essay and illustration by Iowa Young Birders member Coralee Bodeker! On March 4, 2017, young birders, parents, and grandparents gathered in the Science Building on Iowa State University campus to learn tips for identifying Iowa shorebirds. Young birders were excited to peruse the various teaching specimens on the tables and were enthusiastic to master the skills to distinguish species within this challenging group of birds. We started the morning by examining the various teaching specimens, taking time to observe and record the unique characteristics of each. It didn’t take us long to develop a list of characteristics for each species, and pick out those similar characteristics listed for all species (e.g., long legs, longer bill, etc.). Next, we learned how to lump the various species into different groups based on overall size and shape, the first step in helping us to identify a given species. We finished this exercise with an activity in which we placed shorebird silhouettes in the appropriate group based only on size and shape. Next, we talked about how to group the various species based on their foraging methods, “pickers”, “probers”, and “waters”. We discussed these different methods of foraging and how they might affect the bird’s behavior and the location where they are foraging within a specific habitat. 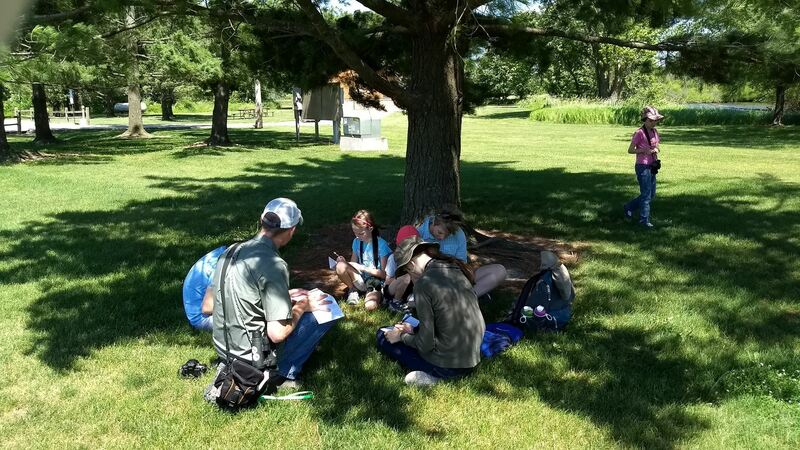 We finished with another activity, “Feeding Time”, in which young birders drew a species from a jar and had to forage for a candy bar in the appropriate habitat using the appropriate method. It was quite fun! We finished the morning learning about colors of shorebirds. Not just color patterns in plumage, but colors of bills, legs, and other markings that are identifying characteristics of some species. For example, we compared leg and bill color of the Least Sandpiper (yellow legs and black bill) to that of the Semipalmated Sandpiper (black legs and black bill), characteristics that can help in identifying these very similar species. Our last activity of the day was to learn the colors of different shorebird species using coloring sheets. Each young birder could color a shorebird species of their choice, helping them observe and learn the different colors of that species. It was a fun morning, and we’re grateful to the parents and grandparents for allowing their young birders to join us! You can view photos from the workshop here. Eagles and gulls were numerous at Credit Island Park on February 18, 2017 where 32 young birders, parents, and grandparents enjoyed a beautiful and unseasonably warm morning of birding. As flocks migrating geese (Snow Geese, Greater White-fronted Geese, and Canada Geese) streamed overhead, we set off to explore this unique park nestled in the Mississippi River. We were quickly greeted by numerous Ring-billed Gulls foraging on shore and over the water, all of which offered the opportunity to study characteristics of these birds at close range. Target bird number 1, check! As we moved toward the other side of the island in search of more gulls and Bald Eagles, we were greeted by three species of songbirds singing. We heard both a Song Sparrow and Mourning Dove in the distance, and stopped to listen to the melodious song of the Eastern Bluebird. A bit more walking and searching turned up the singing male bluebird and everyone enjoyed close-range looks of this beautiful bird. On the other side of the island, Ring-billed Gulls were again numerous foraging over the water and roosting on the ice. Also present were Bald Eagles, both adults and immatures, and young birders were able to compare plumage differences of eagles of different ages. We also observed an immature Ring-billed Gull among the adults, offering the chance to compare plumage differences in different ages of Ring-billed Gulls as well. To top things off, an immature Herring Gull joined the roosting Ring-billed Gulls on the ice. We finished the morning looking for other birds on the interior of the island. We found a cooperative Red-tailed Hawk, a Cooper’s Hawk flying overhead, various woodpeckers, a Northern Cardinal, and several Dark-eyed Juncos. Lastly, we stopped and examine feathers of a Canada Goose, learning about the differences between primary, secondary, and down feathers. We are grateful to Walt Wagner-Hecht for his leadership on this trip, to local guide Jim Nordquist for joining us, and to all the parents, grandparents, and young birders for enjoying a morning of birding with us! You can view photos from our trip here and a list of species here.